A lot of people forget about shipping fees until they start packaging. In addition to the cost of the item, there are a number of other costs that come along with packaging up shipments to be sent off to their destination. Whether you are a business shipping items to your consumers or an individual shipping to another individual, shipping materials and costs can really add up. Here's how you can guarantee the cheapest box shipping rates possible without sacrificing quality transport from A to B. Recycle your shipping materials. Instead of purchasing a new bag of packing peanuts or a roll of bubble wrap every time you need to ship an item, conserve all of the materials that you've accumulated from shipments sent to you. Secure shipping is always a top priority though. These materials should be in relatively good shape as long as the items had been packaged well and nothing has rattled around too much. You can also save boxes that have stood up to past shipments. While couriers from the three major shipping agencies can sometimes be rough with packages, most are very careful to preserve the integrity of the box shipment and will make sure that it stays intact. These boxes can be relabeled, retaped, and sent back out with a new shipment inside. 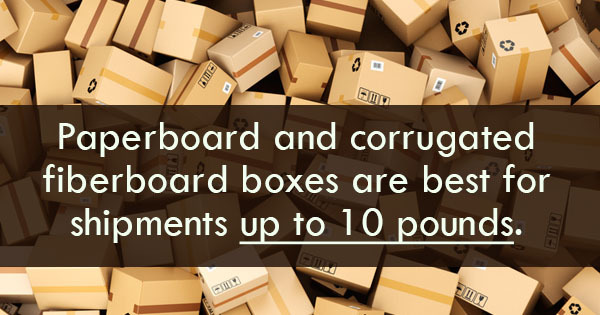 Paperboard and corrugated fiberboard boxes are best for shipments up to 10 pounds, but anything heavier will need more heavily packaging. Package your item well. Whether you've purchased new shipping materials or recycled old ones, it's important that you use them to package your item securely. Again, you cannot guarantee a safe shipment in most cases, so wrapping up your items tightly and making sure that they don't roll around inside the box is crucial -- especially for those smaller, more delicate items. Reinforce the edges of your shipping boxes with heavy-duty tape, too. If you don't make sure that your package is sturdy and secure, you may get stuck paying for damage costs down the road. Track your packages. You want to make sure that you know where your shipment is going at all times. Losing track can cause potential problems and additional fees down the road. If there is an issue and your package has not arrived in a timely fashion, it is important to get in touch with the shipping company quickly in order to resolve the problem as efficiently as possible. For those small, menial items, forego insurance. Most shipping insurance companies won't tell you to do this, but it's true. In many cases shipping with insurance can cost more than the cost of the item itself. Of course, for more expensive items, you should always sign up for package insurance. Whether big or small, these valuable shipments needs some extra protection. Saving money on box shipping rates doesn't matter much if these packages aren't sent securely, but with the help of UNIVAL Logistics, you can guarantee a safe shipment while also keeping your box shipping rates as low as possible.